Within large cities in Indonesia you will find a wide variety of preschool options for your young children. From informal play groups with friends, to neighborhood kindergartens (taman kanak-kanak or TK), to international standard preschools - your needs will be met. Some preschools organize Moms and Tots programs for 1-2 year olds who are preparing to enter a preschool program. There are also many extracurricular activities, including physical play, music, art and other social opportunities for young children which are organized by community organizations or through commercial entities. 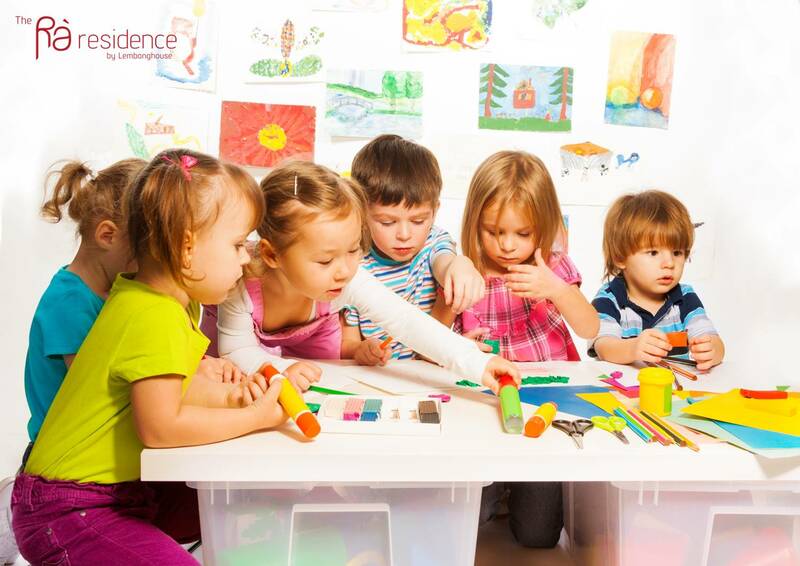 What's most important is to find the preschool experience that you feel is most appropriate for your child. 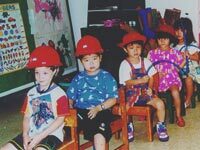 If you are looking for a more Asian academic setting to prepare for elementary school or an open experience and creative play orientation, there is a school that will match your requirements. 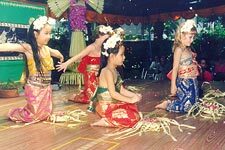 Indonesian preschools and kindergartens (TK) are licensed by the Department of Education and Culture. They must follow a standard curriculum, set by the Department, which prepares children for entry into the Indonesian school system. These schools are attended primarily by Indonesian children and instruction is conducted in the Indonesian language. As the Indonesian school system emphasizes academic skills and pushes children to be able to write before they enter the first grade, TK instruction puts a great emphasis on the forming of letters and copying of words. Due to the limited facilities available and the need to follow the official curriculum, there is not much time for or emphasis on creative play and freedom to explore for the children. Mobility of the children is limited. With the high percentage of middle and upper class Indonesia children raised by nannies, TK is often seen as the place where children learn to feed and care for themselves and begin on the road to independence. If a large block of the school day is set aside for eating, it should be clear that teaching the children to feed themselves (even at age 4 or 5) is a priority at the school. 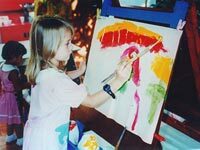 There are a number of excellent preschools owned and run by professionals in early childhood education. While not all may have immediately recognizable 'franchise names', the curriculum, facilities and training are of international standard. 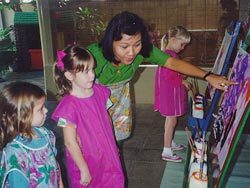 A number of internationally franchised preschools are also found in Indonesia following American, British, Australian or other international education philosophy. Their prices are generally higher than local schools as they must pay a foreign currency franchise fee. While they have the advantage of a set curriculum and assistance in choosing educational toys, materials and facilities, these schools are only as good as the philosophy and training of their teachers and principal. Franchises can be purchased, but good teachers must be trained. A major concern in preschool education will be the language of instruction. While the majority of international preschools profess to conduct their activities in English, the mixture of the children's nationalities may lead to some interesting scenarios. If the children at the school are predominantly Korean, for example, the curriculum may be a mix of Korean and English. 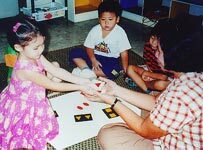 If the teachers in an English preschool are not truly fluent in English, you may also find your child learning Indonesian at preschool. On a visit to a potential school, wander though the classrooms and listen not only to the teacher, but to the children and see what language or languages they are using. Indonesian law does not allow the hiring of expatriate teachers in preschools that are not affiliated with international schools. However, many preschools have informal expatriate advisors who are experienced in early childhood education and have assisted the school in developing curriculum and training teachers. If the school says they have expatriate teachers or leaders, ask how much time those persons actually spend at the school and how much interaction they have with the children. Inquire into their nationality, so that you could access the influences their background may have on curriculum and teaching styles. While the formal education of the teachers is important, even more important is the experience they have had since completing their formal education. Ask what other preschools they have worked for, who they have trained under in their previous teaching jobs and how much time is spent on training the teachers in early childhood development at the present employer's. Not to be ignored is the actual location of the school in proximity to your residence. Driving by the area on a Sunday afternoon is not indicative of what traffic patterns will be like during the week. Will your child have to ride through rush-hour traffic to get to school each morning or can you find a good school closer to home? Try timing the run to the school in the morning rush hour and see how long it takes. If the school is located near a major intersection, near a market or other large school, traffic may be a major problem at drop off and pick up times. While the 'perfect' school for your child may not be conveniently located in relation to your home, you may find an alternative good school where the location won't necessitate a lot of time spent transporting your child. The convenience of the location may outweigh other factors. Inquire about the safety procedures followed at the school. What is the situation in front of the school at drop off and pick up times? I sit chaotic or organized - with a clear emphasis on the safety of the children as they enter and exit the school grounds? Is access to the school yard restricted? Is the gate locked or manned by a watchman to ensure that the gate is never left open? What is the drop off and pick up policy of the school? Is there a system for identifying which persons are allowed to pick up your child? Inquire into the schools policies and procedures when a child is injured, becomes sick or emergency care is needed. A concern of all parents, especially of small children, is how their child will be disciplined. Discuss the discipline policies with the principal and teachers. Ask a lot of . What if .... questions to see how the staff would respond in situations you know your child may get into. Common discipline methods in Indonesian schools are: twisting of ears, rapping of knuckles with a ruler, tape over the mouth, scaring the child or having movement restricted in some way. Ask the teachers what methods they use to discipline unruly or inattentive children. Constructive discipline methods could include redirection (getting the child interested in another activity) and time-out (giving the child a few minutes to settle down and collect him/herself) before returning to the group. A total lack of any discipline or direction can also create a chaotic situation in the classroom, so a creative, caring response on the part of teachers can enhance the positive social and educational aspects for children. Ask if the school has an open door policy whereby parents are welcome to stop by when they want to see the progress and interaction of their child for themselves. A school that has nothing to hide will welcome your interest. Ask if the school conducts a routine assessment of the children so that you can learn in which areas your child is progressing within normal standards and where your child may need extra attention at home. Some preschools provide transportation within a limited area nearby the school. If you are interested in assistance with transporting your child, ask about those services. See the van or bus that is used for transportation to determine if it is safe. Take a test run with the regular driver to see what his driving habits are. Just as wide as the range of schooling options ... are the pricing options for preschool education. A neighborhood Indonesian TK will cost several million rupiah to enter, and up to Rp 500,000/month for school fees. International standard preschools can cost up to $6,000/year. Preschools that are affiliated with the larger international schools may impose a Capital Levy as an entrance requirement. This could be a large sum of money, so be sure to inquire about special levies as well as the monthly/annual fees. Since the cost of international standard preschools is high, ask your sponsoring company if they will cover the cost of preschool for your young children - some companies will and some won't. If you are paying for the schooling yourself, the cost becomes more of an issue. While some good international standard preschools charge in US dollars, they may have the dollars pegged to a rupiah exchange rate that is lower than the market value. These pricing schemes change frequently, so if your initial inquiry and your actual registration cover a span of time, ask if the prices have changed before you register. Talk to friends and colleagues and ask them what schools they recommend. Armed with these recommendations visit at least three to five centers to meet with the principal and teachers and assess the suitability of the environment for your child. Visiting the centers will assist you in forming an opinion of its environment, cleanliness, values and capabilities. Keep in mind that computers, flashy toys or dramatic surroundings aren't necessarily what is most important to children. What matters most is each child's experience. Cleanliness - visit the bathrooms and cooking areas to see what standards of cleanliness are upheld. Ask how often the toys are cleaned. Ask where diapers are changed for children who are not yet potty trained. Attention to fire and building safety issues (there are no official codes in Indonesia). Seem comfortable and are free to move about and investigate their surroundings the way they would at home. Appear healthy and well cared for. Approach the caregiver easily when they need her help or attention. Children running randomly around or bored from lack of activities. Children hurting each other with no adult intervention. Toys that are inaccessible to the kids, unsafe or not appropriate for their ages. Food that can cause choking served to children under three, such as: grapes, peanuts or raw carrots. Physical discipline, including hitting or shaking children. Any verbal reprimand that shames or embarrasses a child. Ultimately the decision on where you want your child to attend preschool is yours. Only you can determine if the school the most appropriate for your child, if it will prepare your child for the next step in their education or if you feel comfortable with the staff and the philosophy of the school. Trust your overall impression of the school - the environment, the professionalism of the staff, the well-being of the children, the activities that are planned. If something doesn't feel right, just keep looking. You will find the right preschool to fulfill your child's needs.